It was after Isaac and I rebounded at the Pennsylvania G/60 Championships (which, by the way, Grant swept 4-0) that I realized how much our results have aligned in recent times. Both of us had been on a steady downward slide since reaching peak ratings during the summer, but produced encouraging performances at the G/60. In light of the similarities, “Also Finding Form in Short Time Controls” would have been a fitting title for this post! However, I think Isaac’s recent results have largely reflected the challenges of adapting to a completely new repertoire, and he weathered some very tough challenges to his new openings in the G/60. In contrast, my trajectory has been more dramatic, as I completely lost my footing against lower-rated players for several tournaments, before notching my first win against a 2300 master. Another painful Panov loss in which I couldn’t come up with ideas against a simple c5/Bb5 setup. See a pattern? It was easy to see I was uncharacteristically rushing in my games and that my lack of opening knowledge had started catching up to me. Both were difficult to accept, as openings had never been an issue, and I had always been a sensible (and often slow) player who ground down everyone under 2000. It goes without saying that I’d never experienced such a drop before, even when I was a 1000-rated kid with an exploding K-factor. Rushed mentality: Earlier, I lamented some obstacles to reaching master. This should have pushed me to prepare for a long journey, but instead I became impatient, and as reflected in my games, reluctant to spend too much energy on games I “should” win. Needless to say, if I reach those heights again, I will not be making the same mistake! Openings: In the past I’ve advocated against focusing too much on openings, and I still believe this to be good advice for many at the lower level. But while studying openings may not be strictly necessary, I’ve come to regard it as something that can’t hurt, as long it doesn’t entail disregarding other aspects of play. For what it’s worth, I do know strong players who don’t dedicate much to studying openings, but their standards are often higher than mine and obviously, the value depends a lot on the opening. Playing the Caro-Kann is not something one does to avoid theory. Controlling factors: This is difficult to describe. Before the Cleveland Open, sitting at a rating of 2119, I was glad not to have any expectations for the event (given a reasonable consensus against building up too many before playing), but had a terrible tournament. This again came back to bite me at the local league, which served as my warmup for the G/60 championships. Analyzing expectations was a bit of an attempt to change how I felt while playing. Even ignoring the many other factors in play, you can’t create mentality in this way. As late as a week before the G/60 championship, I was still planning to take a break from tournaments until the state championship at the end of October. I don’t think this would have been a bad decision, but in the end I decided against the idea of intentionally making drastic changes to my regular tournament habits. Nevertheless, at this point I truly had no particular expectations for the tournament; I definitely thought of it as a more social occasion that normal, as it was the first event of the fall and would draw a large turnout. The top section alone drew 30 people for four rounds, resulting in accelerated pairings for the first two rounds. Although clearly entrenched in the top half of the draw, I was given a first-round White against NM Tom Magar. Tom is a good player, but time is not often on his side and lower-rated players know they can often overpower him if they watch their time. However, the circumstances were different this time, as I was trying to avoid issues with rushing my play. Unfortunately, I didn’t pick the best time control to do so, and despite successfully deploying a Closed Sicilian trap, I played too passively, fell way behind on time, and eventually blundered in time trouble. 1. e4 c5 2. Nc3 Nc6 3. g3 g6 4. Bg2 Bg7 5. d3 d6 6. Be3 e6 7. Qd2 Rb8 8. Nf3!? The first surprise of the game; 8. Nge2, would likely transpose to normal lines usually reached after the 6…Rb8 move order, involving ideas of f2-f4, Bh6, and …Nd4. In the 8. Nf3 line, a temporary Ne1 will still allow White to proceed as normal. However, Black fell for the trap, and it proved to be another example (for me) of opening knowledge being helpful at unexpected times. The point of 8. Nf3!? is clear after 10…Qb6 11. Qb4; after 11…Ke7, 12. e5 is strong, while after 11…Kd7 12. e5! dxe5 13. Nd2 the threat of Nc4 is strong. Instead, Black chose to simply give up a pawn with 10…Ne7 11. Nbxd4 O-O 12. O-O Qb6 13. c3 Bd7. However, my opening success tripped me up here, and suddenly I couldn’t think of a good plan. In fact, I had a rather simple route to a full pawn center via 14. Ne2 Bc6 15. Nfd4 etc. In the actual game though, I fell into time trouble and faced a number of uncomfortable situations. Since I only had 2 minutes left to Tom’s 15, I stopped notating here, but remember the unfortunate position in which I cracked. I opted to let Black prove a breakthrough on the kingside, but surprisingly Black took the safer route of trading off the d5-knight. I calculated a chance to get rid of the f3-pawn, but I figured creating tactical possibilities involving the d5-rook couldn’t hurt, and in a naive effort to gain some clock time, played 34. Qe4+?. Of course, this alone doesn’t kill White, although after 34…Kg8, 35. Nxf3?? certainly did. And 35…Nxf3+ 36. Bxf3 Rxd1+ won, as 37. Bxd1 Qxf2+ mates. Not surprisingly, I was pretty disappointed at the above conclusion. I didn’t care about being in the running for prizes, but more often than not, the start of a tournament sets the tone for the rest of the tournament. Given my recent struggles, it seemed unlikely I would recover. But after all, I was at the tournament to carry on as usual, so I had no compunctions with focusing on one game at a time. I faced a tough challenge in Round 2 from Evan Park, who became the 5th ranked 8-year old in the country after barely a year of tournament experience. He equalized easily against my Bishop’s Opening, and I was lucky to wiggle out of a jam on the queenside when Evan’s weak back rank led to him blundering a pawn. Although there were a few tricks left after that, I was able to convert the ending without too much trouble. The tournament got a little anticlimactic in Round 3, when I was surprisingly paired against another young player, rated 1600 (yeah, pairings when many people have 1/2 are weird). In a Classical Caro-Kann, White’s decision to delay the thematic g2-g4 push one move proved to be an inaccuracy as I traded into a comfortable endgame, playing against an isolated pawn. Although I was given more of a break in Round 3, I expected to be paired back into the strong expert pool for one last chance to show something for my G/60 experience. My opponent turned out to be none other than NM Mark Eidemiller, who had a 5.5-0.5 record against me going into the tournament. This time, Mark settled for a type of Torre system where I equalized easily. However, I’d been outplayed by him in better positions before, so I wasn’t ready to rest anytime soon. …Bg4 would be slightly annoying, so White’s 14. h3 was pretty natural. At this point, I had no clear idea how to proceed; the position as it stands doesn’t lend many active opportunities to Black, so I chose what I thought was a waiting move: 14…Bd7. Up till now, I had been naively hoping to eliminate any imbalances, but after 15. Nb3, something had to give. Should Black prevent Nc5, creating a weakness? Given how annoying the knight looked from my perspective, I decided that 15…b6 would be fairly inconsequential as long as I kept my light-squared bishop, and naturally 16. Ne5 Bc8 17. Rc1 Bb7 followed. 18. Rc3 Rfe8?!. I dislike this a bit due to the possibility of 19. Bb5! inducing the awkward 19…Rec8. This is unlikely to be fatal or anything, but does create some unnecessary pressure for White. However, White chose a more direct defense of the e5 knight: 19. f4? Sometimes in Torre, Colle, or London-like systems this is thematic, but in this case it’s simply weakening, as White isn’t pursuing an attack on the kingside. It’s possible that White overlooked my next move, which is a tad more direct than 19…Nb4 20. Bb5. 19…Ne4! 20. Rc1. At least it’s clear that 20. Bxe4? dxe4 21. Rxe4 Nb4 followed by 22…Nxa2 doesn’t help White. 20…f6? 21. Nxc6? Both of us overlooked 21. Rxe4! dxe4 22. Bc4+ Kf8 23. Qh5! when Black is unlikely to survive the sudden kingside onslaught. Given White’s strong, and likely winning play, I was pretty lucky to avoid this, although it is a bit difficult to notice in a shorter game. After the game move, Black is sailing smoothly. 21…Bxc6 22. Qc2?! Rac8 23. Nd2. 23. Rf1 is of course the critical alternative. However, White’s unfortunate 22. Qc2 allows, at the very least, 22…Bd7 23. Qd1 Ba4 with a lot of pressure on pretty much everything White tries to hold. From here, it’s not as difficult as I felt during the game. A pawn is a pawn, but always mentally tricky when playing someone who tries as hard as Mark does. 23…Qxf4 24. Nxe4 dxe4 25. Qb3+ Kh8 26. Ba6 Rc7 27. Rc3 Qd6 28. Rd1 Bd5 29. Qa4 Rd8 30. Rdc1 Rxc3 31. Rxc3 h6 32. Rc8 e3?! Once again, the power of time trouble began to show as I slipped a bit. White found the cute 33. Qa3! winning the e3 pawn back after 33…Qd7 34. Rxd8+ Qxd8 35. Qxe3. Luckily for me, the a2-pawn was indeed safe and I just grabbed it with 35…Bxa2 36. b3 Bb1. This did make winning more difficult but White couldn’t hold the two weak pawns and airy king. However, by now both of us were well under 5 minutes so we didn’t notate further. I can’t really stress enough how relieved I was after I finally won, although undoubtedly part of this is due to my apparently awful B+2P vs. B conversion (according to Isaac). Although I missed out on prizes (because apparently it’s possible for there to be both 4-0 and 3.5-0.5 scores), I took home a nice 19-point rating increase. I’m going to echo Isaac in that our practice games and discussion have been good for us in recent times. There’s still a lot to do to regain form and eventually make master, but pulling off a win against my toughest opponent (and my first against a 2300+ rated master) is a great confidence booster. We always talk about gender roles in work environments, or even in education, but a lot of times the enormous disparity between just the number of girls that play chess vs. the number of boys. Perhaps this is an activity that interests boys more – that’s definitely possible, but I would like to say otherwise. When I first started playing chess as part of my elementary school’s chess club in second grade, there was about fifty of us – and about half were girls. So no, the problem is not that girls are not interested in chess. But if you took the roster of players from that chess club and looked at it today, I’m pretty certain that I am the only female, if not only player as a whole, that still plays chess. Even back then, when I participated in the Ohio Unrated K-3 Girls Championships, there was only one other player from my school – what happened to the other twenty-some players? I remember that at so many of the tournaments I would participate in, it would be me and maybe two or three other female players – in a section of around a hundred if not more. Perhaps it was this absence of other female players that drove my peers away. To be honest, it was this lack of other female players that drove me to continue playing chess – I always felt like I had a point to prove against my friends who were male players. As of right now, there is only one female player in the Top 100 Standard Rated List – Hou Yifan. In fact, she is over a hundred points higher rated than the second top female player. In my opinion, the fact that Hou Yifan is in the top 100 shows us that there is definitely potential for strong female players, the question now is how to expose more young female talent to the game and how to nurture their growth in the field. So with all of this in mind as well as my phenomenal experiences at the Susan Polgar Girls Invitational, I decided to create the NJ All-Girls Chess Camp in 2014 to at least try to provide more young female players with the opportunity to learn the game (its free to all participants), have the resources to keep playing (everyone gets a free chess set) as well as meet other female players in their area so that they do not feel alone. Now, a good friend of mine made me realize that part of allowing girls to better nurture their skills is to teach boys to respect the female players more, not simply to isolate the girls apart from the boys. So I’ve taken the first step – I’m bringing the game to the female players – but now it’s your turn: show those around you that you respect female players as much as your male peers. Who knows, one of these bright upstarts may become the next Hou Yifan or better! As some of you may have noticed, my results following the US Junior Open have been uncharacteristically poor. After taking a beating in the top section of the World Open, I followed up with an uninspired showing at the Southern Open, eventually dipping below 2100 despite much-improved play at the Washington International. Was there an end in sight? 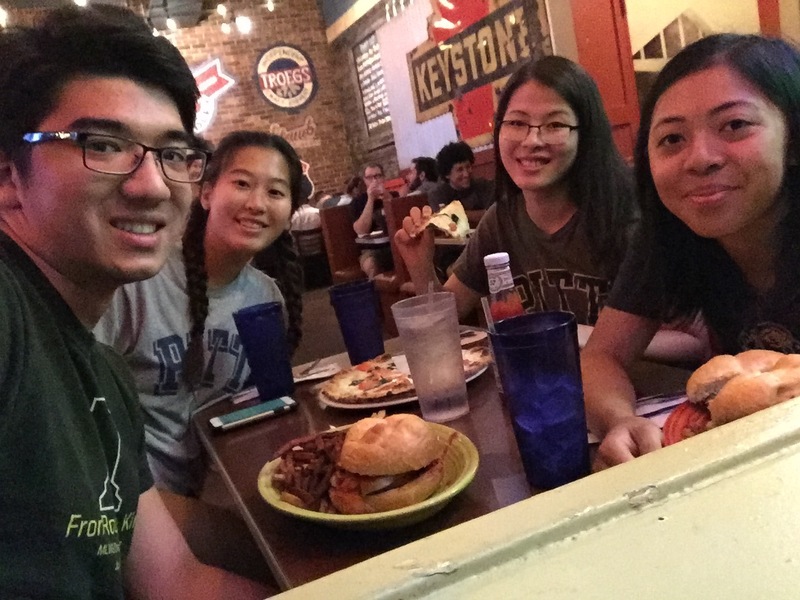 Reunited with friends at late night Fuel and Fuddle! Though I had been looking forward to my second year of college, moving back to Pittsburgh also posed a potential distraction from my ability to study chess. As Alice mentioned last week, with all of the academic and social obligations, the time remaining is not ideal for a chess player aspiring to become a master. In an effort to continue where the summer left off, I continued to wake up at 6:30 each morning to exercise and work through tactical exercises and opening preparation. Admittedly, getting out of bed has been quite difficult, as there haven’t been many opportunities for me to prove to myself that the preparation was making a difference. Killing some time before the Student Activities fair during Orientation week. To make up for this, I’ve been meeting with Beilin each week to play practice games and identify holes in my theoretical knowledge. While this doesn’t quite compensate for a lack of rated games, we really push each other to the brink when we play each other. So far, each of the six games we’ve played this year have been decisive. 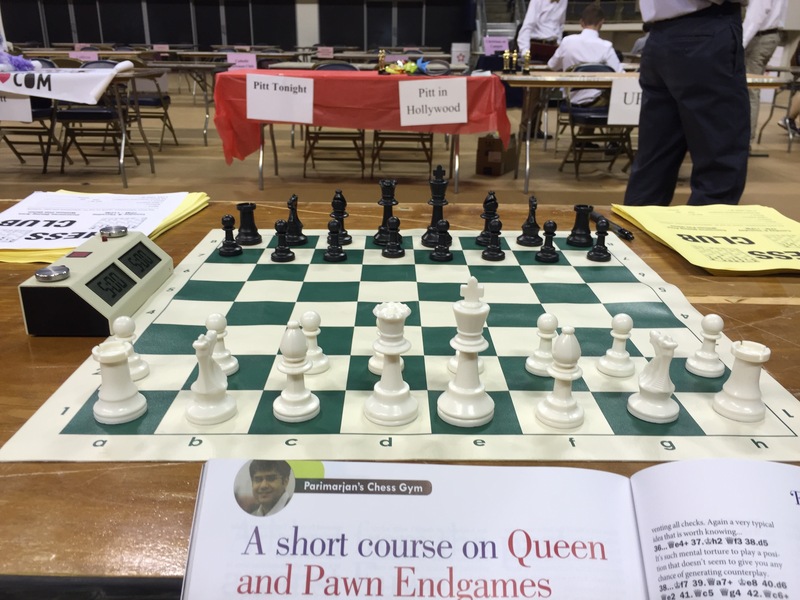 For my first month back in Pittsburgh, I had two events I wanted to be ready for: the Pittsburgh Chess League season opener and the G/60 Pennsylvania State Chess Championships. The Pittsburgh Chess League, as Beilin discussed last week, is one of the most exciting chess events in the city, and is the oldest league of its kind in the United States. That being said, amidst the opening match confusion, our opponent’s forfeited three of the four boards, leaving me with no game to review going into the G/60 Championships. Forfeits seem to be really common, but this was actually the first time in 13 years (and over 800 rated games!) that this has ever happened to me. Certainly not ideal timing for a first. Breakfast at Pamela’s! 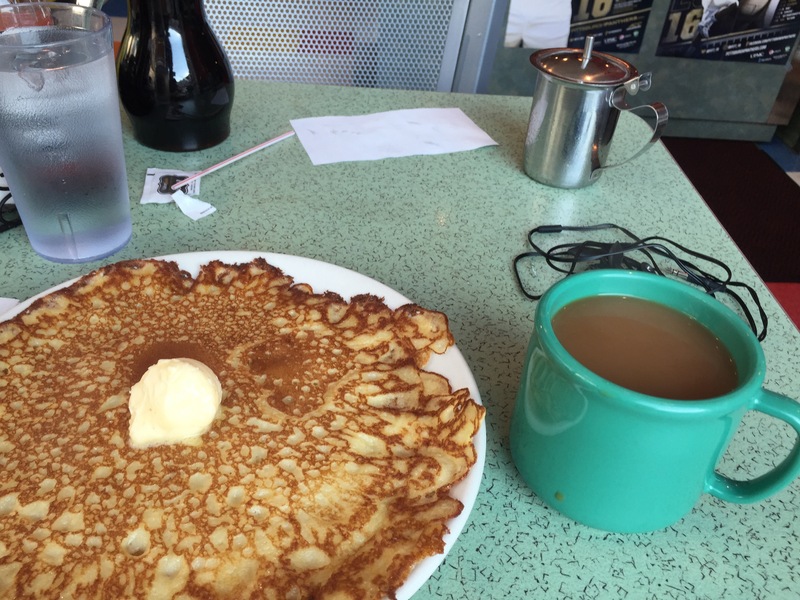 I try to grab breakfast here before I play in Pittsburgh – easily some of the best pancakes I’ve ever had! One weakness I always felt I had is an inability to play in quick time controls, which is why, somewhat understandably, I was extremely nervous about competing in a G/60 time control against a very talented field. My fears tripled when I was paired against my US Junior Open trainer, National Master Franklin Chen, with Black in the first round. Franklin opted to reach an endgame where he could play for two results, but luckily for me, I only had one weakness and managed to hold a draw. While that game was interesting, and certainly instructive, I wanted this article to focus on my second round win against a National Master. I’ve noticed that a lot of the posts here on Chess^Summit over the past week have been focused on attacking chess, but how do you punish your opponent for attacking prematurely? I played my second round opponent last year in the same event and thought I should quickly share that game first before comparing it to my win. Even though I lost, you can see how White’s unorthodox way of play created too many weaknesses and surrendered the center making it far too easy for Black to equalize and more. In our second game, we reached a similar position but a tempo down. One of the things I love about the English against 1…e5 is that it’s a hyper-accelerated Sicilian a tempo up and colors reversed, so it forces Black to come up with creative solutions to make up for the lost tempo. Having played on the Black side of a closed Sicilian many times, much of that experience has helped me develop optimal play with the White pieces. In this game, Black carried through with his …g6-g5 play, and being a tempo up, I didn’t have to slow play the position with Nf3-e1. What a difference a tempo can make! That moment when you realize you are playing chess again! I wound up getting Black in each of my last two games, drawing each with far less impressive play than I started the day with. That being said, my ability to hold positions was strong enough to finish the day undefeated despite three blacks over the four rounds. This is easily the best performance I’ve had since leaving Charlotte last May, and it’s an even bigger success considering I got paired with three blacks and my predisposition of not playing my best in shorter time controls. I have to attribute some of my success to my practice games with Beilin, as each of my first two games each stemmed from practice games of our own (shout-out to Beilin for beating his first 2300+ rated opponent and finishing 3/4, by the way – I hope he’s getting as much out of our matches as I am!). Of course, this one weekend alone will not make up for the past few months of poor performances, but it’s a great first step and shows I was able to build off of my Washington International performance. Hopefully, this success will make it a lot easier to continue waking up at 6:30, and realize that yes, it makes a difference! Like many of my students, most chess players have a particular lust for a great attacking game. Players see the dazzling attacking games of Mikhail Tal, the great Garry Kasparov and want to dispatch of their opponents in similar fashion. The issue for most players is that attacking greats like Tal and Kasparov had a knack for knowing the proper moments to attack. The late IM Danny Kopec once assisted me with a camp in Charlotte and noted while showing a game that a proper attack can rarely be conducted if ones rooks are not connected. I think that this is generally a good rule. In most cases your development must be completed before an attack can be conceived. Similarly your opponent may lag behind in this department giving you the cue that you’re ready to go! Your opponents king safety as well as your own is also a good indicator of whether an attack should be conducted or not. If your opponent lacks king safety (can not castle or has not castle) this is generally a sign that you should proceed aggressively. The flip side of this notion is that if your own king is not safe, conducting an attack will not likely succeed. Lastly, coordination of pieces is very important. “Knights on the rim are grim”, “Knights on the rim are better for him” – GM B Finegold, et cetera. Pieces should be harmoniously placed (toward center, active roles) before any dreams of attack can be fulfilled. I hope you enjoyed these games as well as the article! Hopefully your next games will feature great attacks which were conducted properly due to your acknowledgment of the factors in an attack listed above! It’s the age-old question that has plagued both amateurs and grandmasters alike: At what point should I settle for a draw? As a player that’s encountered this question myself in numerous situations in the past, I always knew it was an interesting dilemma to deal with. However, it was not until recently that I realized how crucial it truly is to make that decision correctly the first time. It’s almost funny because we have all had those moments where we are completely bewildered as to why someone would take a draw in a position where it seems as if playing on is a decision that’s easy to make. On the other hand, there are also those situations where it seems almost foolish to play on because the game should certainly end in a draw, right? Well, there’s more to it than one would think. I, speaking from personal experience, have been on the receiving end of all three outcomes. Due to the knowledge that a draw as the end result doesn’t teach much, we will stick to the decisive results in this article. Of the many that I have played, there is one game that stands out above the rest when it comes to being associated with this eternal question. Never let your guard down, even if your brain tells you a draw is certain. Always consider the possibility of a breakthrough. This goes for you being the receiver and the propagator. If you will yourself to find one, more often the not, you can, thus allowing you to either execute it successfully or defend against it before it can be sprung. While most people, including me, would have taken a draw as White in that position, my opponent found a creative possibility for a breakthrough, and he was able to execute it with perfection. I have also had my fair, albeit much smaller, share of games where I won as a result of an opponent that pushed too hard for a win. The most recent of these examples was played this past weekend, so we’ll take a look into this one. If it’s a completely, dead drawn position, take the draw. You won’t win a position like my opponent tried to do at the end there. As a rule, only play on if there is a clear imbalance. Always take into account the amount of time left on your clock. Usually, gauging whether the time left is enough to push without too much danger is the best place to start. In these two examples, we looked into the simple assessments of the positions and external factors to decide whether it was justified to play on instead of taking a draw. The first game was a perfect example where it was indeed a smart decision to play on, as there was a clear breakthrough that was there for the execution. The second game was a clear-cut example where the player had to take a draw, as there was nothing to really play for at that point. There were certainly lessons to be learned from these games, just as any other, but these were all connected to the idea of taking the draw at the right time. As always, I’ll see you next time, and I wish you luck in your future games related to the topics discussed today!